How to hire with us in six easy steps. The quickest and easiest way to make an enquiry is via our website. Browse our categories and collections, filter by colour and style or search by keyword. Add any items you are interested in to an enquiry, enter your hire dates, then click submit. If you have any questions, give us a call and the Sales Team will be happy to help. Once submitted, your enquiry is picked up by the Sales Team. They will check the items’ availability for the hire dates provided and send you a quote with photographs for ease of reference. Please note, our hire charges are based on multiples of weeks. Contact your Sales Advisor directly if you want to make a booking - use the contract number on your quote as a reference. Come and visit our showroom, just 20 minutes from Central London. View our collection, meet the team and use the client workspaces. We have a large collection of small props to explore – it’s so vast and varied we can’t list everything on our website! We are open Monday – Friday, 8.30am – 5.30pm. There’s no need to make an appointment. Contact your Sales Advisor to tell them which items you’d like to book. To confirm a hire and before items can be collected, you need to complete our Rental Agreement and make payment. To find out more about payment terms, see our FAQs or speak to Accounts. Confirmed hire jobs are packed ready for collection from the Loading Bay. You will need to arrange your own transport – we can recommend a trusted courier service. Your driver will need to quote your contract number and company name on arrival. Items are wrapped where appropriate but we require transport companies to provide blankets and ties. We recommend you check all items and call us with any queries – keep the delivery note and original packaging. You should return all items by the date agreed with your Sales Advisor - please call us in advance if anything changes. Use the delivery note to check you have included all items and chargeable packaging needed for the return. Once received, your job will be checked and we will notify you if there is anything missing or not as expected. Job completed! Browse our categories and collections using the top navigation bar. Use the category filters to sort by type, colour, style, material or size. Search by keyword, description or stock code using the search box (click the magnifying glass to open). 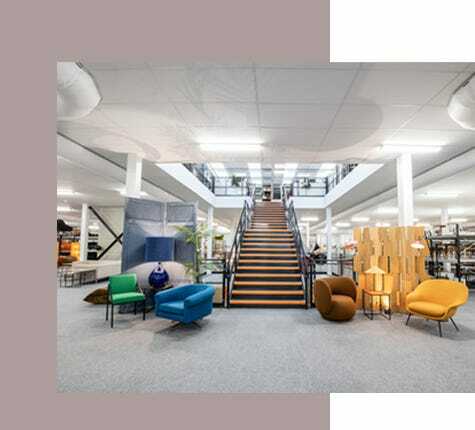 View our extensive collection in person; everything is displayed and arranged by style and colour to make selecting to your brief as easy as possible. Explore our vast and varied collection of small items (not shown on our website). We recommend that you come to view items in person; whilst we do our best to convey accuracy in our images, the colour and condition may vary. If you are coming in to view a particular item, call ahead and we will double check it is in stock. Click ‘Create an Enquiry’ on the homepage. You will be prompted to register for an online account for easy sign-in next time. Click the ‘Add to Enquiry’ button for any items you are interested in. You can work on multiple enquiries at one time and separate your lists into different sets or productions. Visit ‘My Enquiries’ to review your list(s) and make any changes to items or quantities. Once you are ready, complete the enquiry details form, provide your hire dates and click ‘Submit Enquiry’. You will receive an email to confirm we have received your enquiry. We aim to respond to all online enquiries within 24 hours and prioritise based on hire collection date. A member of the Sales Team will send you a quote via email listing the items currently available for your dates. 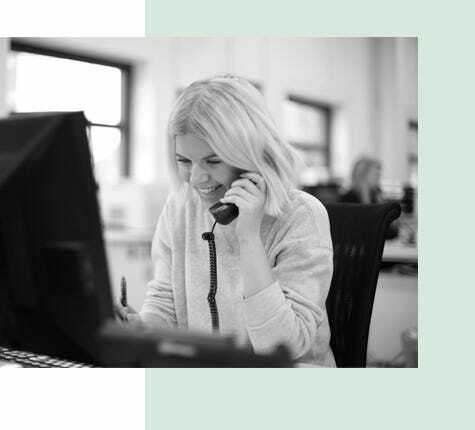 If you have any questions or want to make a booking, please contact your Sales Advisor directly – once submitted, you cannot make any further changes to enquiries via the website. The Sales Team can provide a quote for items over the phone or via email. Use our stock codes (e.g ARM002) as a reference and provide your hire dates so we can check availability. If you would like prices for more than 3 items, we recommend submitting an online enquiry or listing the stock codes via email - this is the quickest way to receive a quote for multiple items. Please include your hire dates so we can also check availability. For furniture and large items, view and photograph them at our showroom then speak to a member of the Sales Team. You can simply show your pictures or walk around with them if you prefer; they will give prices and check availability whilst you are here. All items are labelled with a stock code – it is helpful to make a note of this and use as a reference when enquiring. For small items, we ask clients to make their personal selection onto a labelled trolley and we can then easily add these to a quote. Please note, you can only reserve small items on a trolley 2 weeks prior to your collection date. If you are planning to visit in advance of this, you can take reference pictures and get ballpark costs in the meantime then re-visit to make a selection nearer to your hire dates. Contact your Sales Advisor to tell them which items from the quote you would like to book. They will make any final amendments and send you a revised quotation.To confirm a hire and before items can be collected, you need to complete a Rental Agreement or send us a Purchase Order. For clients without a credit account, we require payment for the hire via card over the phone or bank transfer before collection. For more information, see PRICING & PAYMENT below. To confirm a hire and before items can be collected, you need to either complete a Rental Agreement or send us a Purchase Order. Our Rental Agreement is a short online form; your Sales Advisor will send you a link to it via email. It should be completed with the hiree’s details and contract number (found on our quotes) then signed (you can sign using a computer mouse or your finger if on mobile). Once you click submit, the Rental Agreement is automatically sent through to the Sales team. What happens if I need to cancel items? If you need to cancel hire items, please contact us at least 24 hours before your collection date. A cancellation fee (50% of the total hire cost) is charged for confirmed hires cancelled within 24 hours of collection. This is to cover the costs of labour, packing and loss of potential hires. Our hire charges are based on multiples of a week and do not include VAT or transport. For clients without a credit account, we require payment for the hire before items can be collected. Our payment terms for credit account clients are 30 days from invoice date unless otherwise detailed. Payment can be made via card over the phone; we accept all major credit and debit cards including Visa, Mastercard and American Express. You will need to quote your contract number when you call. We can email a receipt to you should you need. Payment can also be made via bank transfer. We will require a remittance to be sent via email as proof of payment. Please let your Sales Advisor know if you need a copy of our bank details or a pro forma invoice. Please note, in providing your card details, you authorise the use of this card for any outstanding additional charges e.g extended hire, loss or damage. You will receive a notification before if being charged. We raise final VAT invoices the day after jobs are dispatched. These are emailed or posted to the address on your Rental Agreement or Purchase Order. We ask that clients do not remove or alter any art fixings or remove glass and pictures from their frames to avoid a reframing or damage charge. We hold copyright licences for artwork where ‘Licence to Use’ is included in the item description on your quote. You can also use the ‘Licence to Use’ filter on our website to view artwork by this type. For these items, we are able to sign an artwork release form provided by the client listing the relevant artwork stock codes. It is the client’s responsibility to do any research to gain permission to use for their needs; we will of course provide information where we are able. For more information on copyright clearance, please see ‘Other Questions’ below or call us to discuss. All our beds are sent dismantled for easy assembly on set. All parts are listed in the item description. We have mattresses available to hire; these are priced and hired separately so please let your sales advisor know if you would like to hire a mattress. We have headboards available to hire which work particularly well with our divan base beds. Our headboards are not freestanding; they should be supported from behind against a wall and not fixed to any bed or surface. Our lamp bases and shades are priced and hired separately. We have lamp and shade combinations photographed on our website or you can view the full collection by visiting our showroom. Please speak to your sales advisor to discuss your requirements and check your hire quotation before confirming to ensure you have everything you need. Lamp shade fitting accessories and adaptors (e.g shade carriers) will be provided and charged if not returned. Lightbulbs are not sent with lamps unless specialist bulbs are required - this will be listed in the item description. We can provide you with information on what lightbulbs are required for your hire in advance – please speak to your sales advisor to discuss. Please note, some of our more delicate lamps require low wattage bulbs to avoid damage by over-heating, this will be noted in the item description. Some of our large and heavy mirrors cannot be hung and must be leant against a stable surface only – this will be highlighted in the item description. Some items may be sent in parts and will need to be assembled on set. This may include shelving units, cupboards, beds and divans. All parts will be listed in the item description on your quote and delivery note. Please contact us for further assembly instructions. Some of our more delicate, vintage items are not for practical use and are props only. This may include items such as ladders and bikes. This will be high-lighted in the item description. For more information on stock and how we recommend to handle and package items, please see our Item Care and Instructions guidelines provided with all quotes and delivery notes. This is also available to download below. You will need to arrange your own transport; this is not included in our hire charges. We can recommend a trusted courier service and advise on vehicle sizes should you need. Items are collected from the Loading Bay at our showroom. Your driver will need to quote your Contract Number and Company Name on arrival. Our team will help with loading and then provide a delivery note. All our items are wrapped and protected for dispatch but we require transport companies to provide blankets and ties so items can be secured during transit. Our Loading Bay is open Monday – Friday, 8.30am – 5.30pm. To allow sufficient time for loading, we require transport to arrive no later than 5.15pm. Contact your Sales Advisor in advance to discuss collection time options and we will see if we can meet your request. Items are wrapped and protected for dispatch following our Item Care & Instructions guidelines (available for download below, and sent with our quotations). We recommend keeping the original packaging to use when returning your job. The delivery note provided will list any specialist chargeable packaging or item-specific packing instructions. We recommend you check over all items when you receive them and call us if you have any queries – you can use our delivery note as a checklist. Any discrepancies should be reported to us within 24 hours of collection. Please have your contract number and item stock codes ready when you call. We may ask you to email pictures to loss-damage@grangerhertzog.com so we have a record of how you received items. Once your job is returned to us, we will assess all items, evaluate any new damage and advise on charges where necessary. Please note, items are the responsibility of the hiree from time of collection until return. Yes, you need to arrange insurance for all items - they are the responsibility of the hiree from time of collection until return. Your quote lists the ‘Total Risk Value’ per item. This is the replacement cost chargeable to the hiree if an item was lost or damaged beyond repair. Please call us immediately if anything is lost or damaged whilst out on your hire. We will need to check if this affects any upcoming hires on that item. We may ask you to email some pictures to loss-damage@grangerhertzog.com to help us make any urgent restoration or replacement arrangements. In order to avoid any additional charges, we recommend coming to view items at our showroom so you can be sure they are suitable for your specific needs. We are happy to advise on this and how items should be best transported if you need. We will confirm if extending the hire is possible and provide a quote via email. You need to send a new Purchase Order and arrange payment to confirm, then we will send an extended hire invoice. Visit our inspiring London showroom to view our extensive collection in person and explore our amazing small items department. We have client workspaces, wifi and great coffee! We are open Monday – Friday, 8.30am – 5.30pm. There is no need to make an appointment but if you are coming in to view a particular item, let us know and we can check it is in stock. We are located just 20 minutes from Central London via public transport. Harlesden (Bakerloo line) and North Acton (Central line) stations are both a 10-15 minute walk away. We have close access to the A406 North Circular and the A40 and plenty of parking on site if travelling by car. Or call the office on 0208 965 6252. No the collection is for hire only, we do not sell our items. Yes, it is possible to hire our items for use in oversees productions. Please let your Sales Advisor know in advance if this is the case. You will need to arrange your own transport; this is not included in our hire charges. We hold copyright licences for artwork where ‘Licence to Use’ is included in the item description on your quote. For these items, we are able to sign an artwork release form provided by the hiree listing the relevant artwork stock codes. 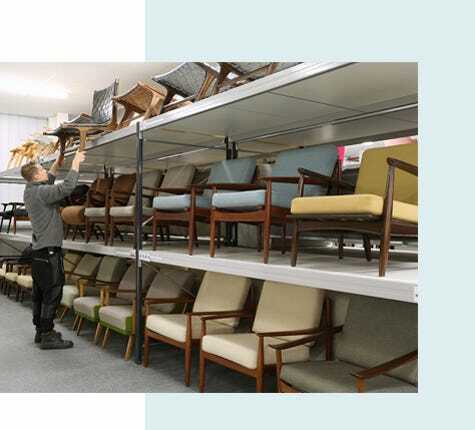 We do not hold specific permissions or licences for furniture and other items. Where possible, we make our contemporary suppliers aware of the nature of our business. 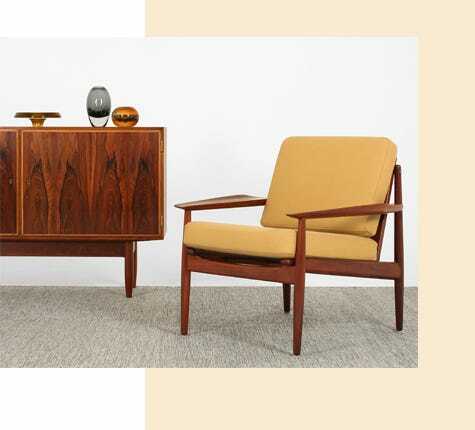 For vintage and midcentury items, we include designer names in our item descriptions if known. It is the hiree’s responsibility to do any research to gain permission to use for their needs; we will of course provide information where we are able.